We have the winner! -- Announcing winners and honorable mentions of Japan Day Art Contest 2017. 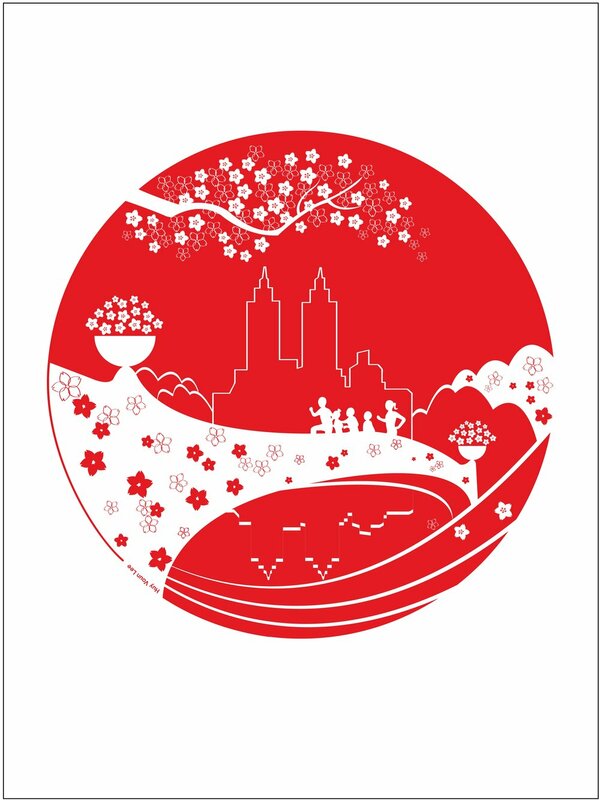 Japan Day selects a Japan Day Official Artist each year, whose artwork will become the official image of Japan Day @ Central Park and will be used for our official poster, program, flyer and T-shirts. Japan Day Official Artist will also receive a special prize, a pair of round-trip economy class tickets to Japan, provided by ANA. Additionally, several entries will receive honorable mentions. All winners will receive a digital camera provided by Nikon Inc. Moreover, their artwork will be displayed at an exhibition space on the 18th floor of the Consulate General of Japan in New York. All winners will be honored at an award ceremony on the day of the event. Marcelo Maziero is a 3D artist/animator, who works for ABC News Good Morning America since 2009. He was born in Brazil, and since an early age drawing has always been one of his passions. After finishing art school in Brazil, Marcelo moved to NYC where he took animation classes at NYU to pursue a career as a 3D artist, since then he has worked on many projects for film and television. Since 2014, he has been studying Japanese language and culture, being a part of Japan day NYC is a great honor for him. In his free time, he enjoys wood working, designing, and building artisanal Taikos, Japanese style drums. Born 1994 in Russia, Toma is a NYC-based illustrator. She grew up on Sakhalin Island which is right above Japan. Imported Japanese products with their package designs influenced her since childhood and some of it has become a part of her visual language. Her work is inspired by Japanese bubblegum wraps, IKEA manuals and Russian Constructivism. This year she is graduating from the School Of Visual Arts. Kickie is an Industrial Designer born in Bratislava, Slovakia - currently living and creating in New York City.Fascinated by new technology and influenced by the arts, Kickie is in constant search for unique balance.Passionate when making and producing with her own hands as she does in 3D software.She believes advanced technology, environmental caution and beautiful shape is the winning combination for designing objects that can significantly improve our world.A color lover,striving for perfection & simplicity with big attention to detail. Brooklyn based artist Abby Goodman, received her BFA at Tyler School of Art. She continued training as an iron-working apprentice in the French Alps, and later, at the Johnson Atelier Technical Institute for Sculpture, where she spent several years executing bronze sculptures for the public arena before completing her MFA at Syracuse University. Her artwork has been featured in several publications, including the New York Times, Studio Visit Magazine, and New American Paintings. Goodman exhibits her work in galleries and museums internationally, and was most recently featured in a group show at the Met. Born in Cambodia, Huy is a children’s book author and illustrator. She has illustrated numerous award winning picture books, including RED, WHITE, AND BOOM!, a CCBC Choice (Univ. of WI), Bank Street Best Children’s Book of the Year, and Parent’s Choice Honor Books. The book illustrations were selected for the 2012 Original Art Show. Huy also teaches paper-cutting and origami as a visiting artist. Deepti sonkar has a great interest in arts, and she feels grateful for this chance to express her passion through Japan Day Art Contest. She would like to thank her both brothers who taught her how to use the software and supported her passion even though she didn't pursue any professional animation course. Digital camera provided by Nikon Inc.
All winners’ artwork will be displayed at an exhibition space on the 18th floor of the Consulate General of Japan in New York. *A pair of round-trip economy class tickets to Japan (JFK – Tokyo/Narita), exclusive of any applicable taxes and fees as well as travel expenses in Japan such as accommodations.